Sixth-grader Tatiana Lebron, 12, carries her viola from music practice at a rally for Lafayette in March 2013. HUMBOLDT PARK — The halls of Humboldt Park's shuttered Lafayette Elementary will once again be filled with students this fall as the Chicago High School for the Arts makes what officials hope will be a permanent home in the neighborhood. The building at 2714 W. Augusta Blvd. still has the Lafayette name etched in stone, but the incoming school known as ChiArts will open there in September after construction is complete Monday. The new school is not a charter school, but it’s also not a traditional neighborhood school. It’s governed by a board with a CPS contract, according to ChiArts spokesman Chris Smith. Lafayette Elementary School, 2714 W. Augusta Blvd. 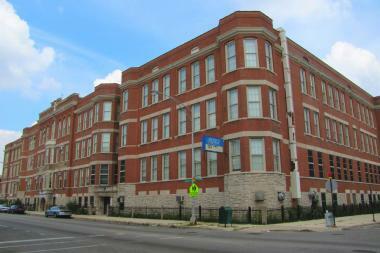 The school was operating out of a shared building in Bronzeville last year, but it will reopen as the contract school’s first home in Humboldt Park. The school focuses on dance, music, visual arts and theater, but each student is trained across disciplines, Smith said. The program encourages young rappers to explore ballet, graffiti artists to dive into formal painting, and students raised in gospel traditions to study written music, for example. All classes are modeled on college programs and are taught by experienced teachers, according to Smith. And those courses will be held in the schools' newly constructed facilities, among them an auditorium, a visual art gallery, a black box theater, storage spaces, dance and visual arts studios as well as a library — a first for ChiArts. “We’re trying to lay the ground work for a new generation of artists,” Smith said. 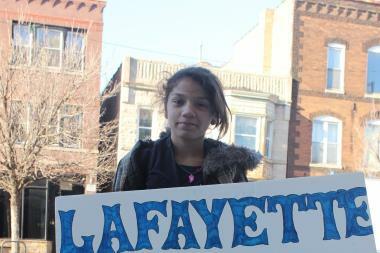 "A year later and I still feel hurt"
The transition from Lafayette Elementary to ChiArts hasn’t come without conflict — a struggle that’s still raw for former Lafayette parents like Rousemary Vega, who staged a nearly four-hour sit-in at the site with her family in June 2013 to protest Lafayette’s closure. The "Bad--s Moms Association" member has been a fierce opponent of Mayor Rahm Emanuel and CPS officials since more than 50 schools were closed last year. Video from a recent CPS meeting shows her and her husband being forcibly removed by security after Vega called the city's schools officials "cowards." “[CPS] took a neighborhood building and turned it into a private selective school,” Vega told DNAinfo Chicago, in tears at the mention of her former neighborhood school. "How is it good for the community when not everyone can have the opportunity?" The loss of Lafayette is still an open wound, she said. Her kids are doing well at their new schools — Lincoln Park High School and Pritzker Elementary — but her oldest, an honor student and former cellist with Lafayette’s string orchestra, was happy and doing well at her old school in Humboldt Park. CPS said low enrollment was the reason for Lafayette's closure, but before it closed, the school had about the same number of students as ChiArts will have. Many of Lafayette's nearly 600 students have transferred to Chopin Elementary, Vega said. According to Smith, ChiArts’ 600 students come from all over the city. In response to Vega’s concerns, Smith said that ChiArts hopes to be a community asset in Humboldt Park despite the loss of Lafayette. “I hope [residents] can also appreciate that we want to move into this community and do good in the neighborhood,” he said, adding that the school eventually plans to offer public music and arts classes at the site’s state-of-the-art facilities. ChiArts has moved several times since it opened in 2009, and at one point there were plans for the school to share the Lafayette building. But Smith emphasized that closing Lafayette was "out of ChiArts' hands." The new campus will offer standard courses for part of the day, followed by arts-focused classes and workshops in the afternoons, where students will be able to hone their craft. Students will be accepted via a combination of academics and an audition process held in January and February, with an application schedule set for October through December. As a contract school, ChiArts can decide terms of enrollment, while charter schools can determine enrollment by lottery, according to CPS. Some contract schools employ union teachers, but they are not required to. Contract school students must abide by the CPS code of conduct, while charter school students are not required to.